Anyone intent on buying an e-book reader for Christmas now has a very limited choice, after Barnes & Noble joined Sony in saying its machines had sold out already. The bookseller's Nook e-book reader is now out of stock in the US, the only market where it's even supposed to be available. 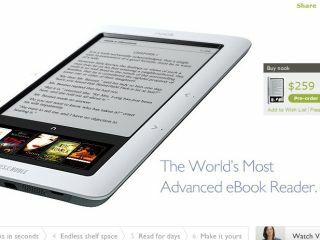 It joins Sony's Reader on the sold-out list, leaving only Amazon's Kindle among the mainstream options. Barnes & Noble said it had miscalculated the level of demand for its Android-powered book reader. It explained: "While we increased production based on the high consumer interest, we've sold out of our initial Nook allotment available for delivery before the holidays." It added that some Nooks are still available in its larger shops, but that orders already placed are unlikely to be fulfilled until January. In contrast to last year, when Amazon experienced similar supply problems, both Kindle models are in stock and ready to ship.